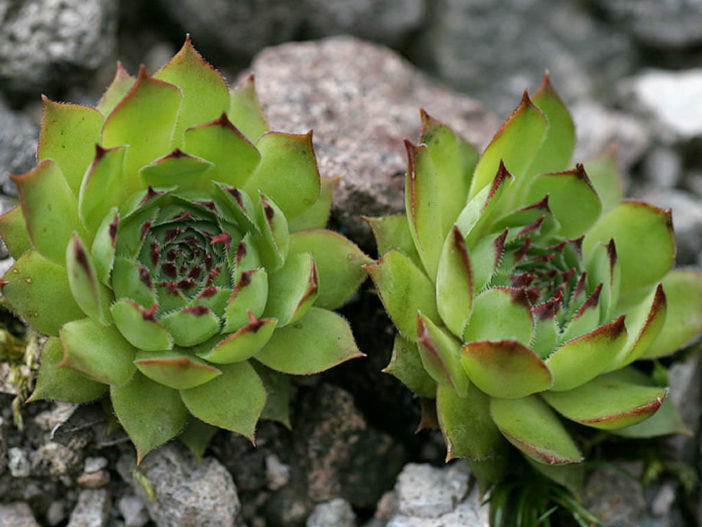 Sempervivum tectorum is an evergreen, perennial, mat-forming succulent that typically forms rosettes up to 4 inches (10 cm) across, of 50 to 60 thick glabrous leaves up to 3 inches (7.5 cm) long, that are sometimes purple-tipped. The mother rosette spreads in all directions by horizontal stems to form offsets. 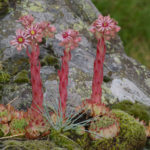 In summer, leafy, pubescent, upright flowering stalks rise from the mother rosette to as much as 12 inches (30 cm) tall topped with cymes of red-purple flowers. USDA hardiness zone 3b to 11b: from −35 °F (−37.2 °C) to 50 °F (+10 °C). 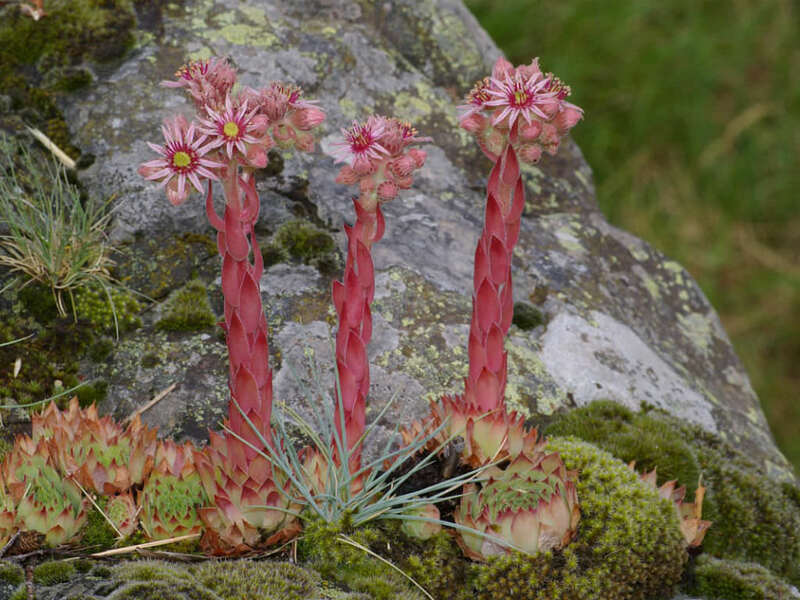 Common Houseleek can be grown from seeds, seedlings or by dividing offsets. 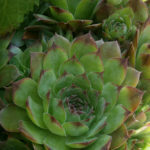 Don’t plant your Common Houseleeks too deeply. Dig a shallow hole and spread the roots. Cover to the crown of the plant and tamp the soil gently so that the plant is firm in the ground. 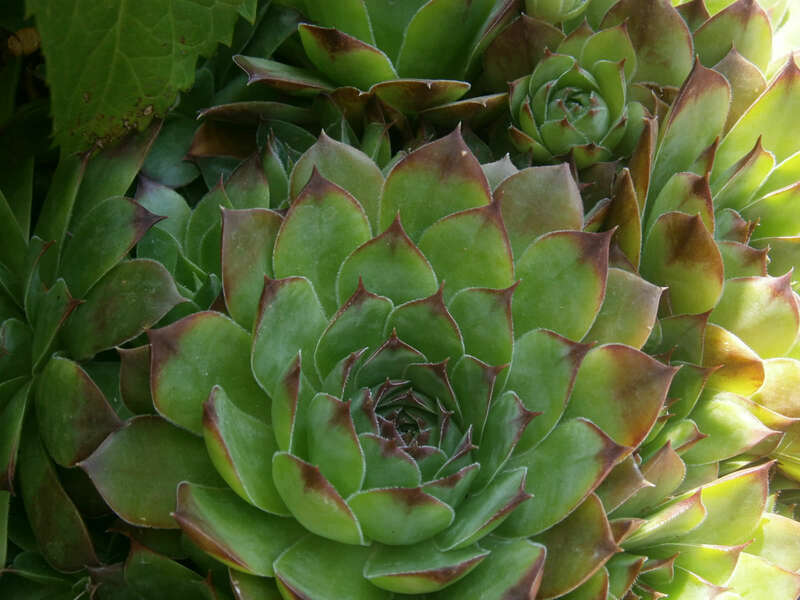 Water lightly, but you don’t need to water newly planted Common Houseleek every day, the way you would with non-succulents. 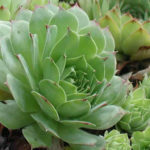 Common Houseleeks need to let their roots dry out between waterings. Seeds can be sprinkled on top of a soil, gravel mix and kept moderately moist until they germinate. Once they sprout, sprinkle some fine gravel around them as mulch. Seeds are usually started in pots and then transferred to the garden as seedlings. You can start your seeds in the fall and transplant in the spring. The juice and leaves have been used in folk remedies for centuries, for their coolant, anti-inflammatory, astringent and diuretic properties. 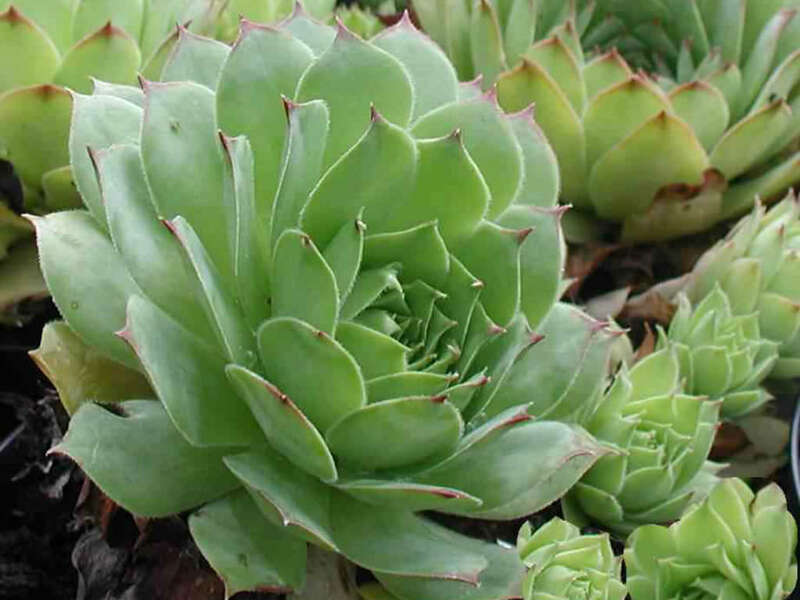 Bruised leaves of the fresh plant or the juice from the plant can be used as poultices for burns, scalds, ulcers and any inflammation as the pain is quickly reduced. Honey mixed with the juice helps relieve the pain of mouth ulcers… – See more at: Houseleek – Superstitions, Hystory and Medicinal Benefits. Native ti the Mountains of Western, Central and Southern Europe, from Pyrenees to Alps, Apennines and Dinarides.